Bear is a beautiful, flexible writing app for crafting notes, prose, code and now sketches! Link notes to each other to build a body of work. Use hashtags to organize for the way you think. And yet, all notes are stored in plain, portable text. Bear is perfect for everything from quick notes, to code snippets, to in-depth essays. A focus mode helps you concentrate, and advanced Markdown and other markup options are an online writer’s best friend. Full in-line image support brings your writing to life, and keep yourself on task by adding todos to individual notes. Requires a Bear Pro in-app subscription. Learn more below. Bear’s simple tools take the effort out of writing, whether you need to hit specific word counts and reading times, or you need to convert your writing into PDF and Word docs. With Bear’s custom markup shortcuts, you can add style and links with just a tap or keystroke. Bear works on your devices, so you can write wherever inspiration strikes. 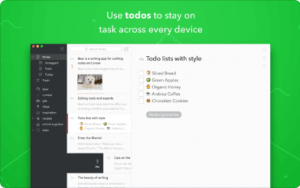 Use todos to stay on task across every device. Bear can instantly search all your notes, but it can also focus on specific things with Search Triggers. Use @task to find all your todos, @tagged “ideas” to find your notes that are waiting to blossom, or @files to find all notes with attachments. Price may vary by location. Subscriptions will be charged to your credit card through your iTunes account. Your subscription will automatically renew unless canceled at least 24 hours before the end of the current period. You will not be able to cancel the subscription once activated. Manage your subscriptions in Account Settings after purchase. Any unused portion of a free trial period, will be forfeited when the user purchases a subscription.